Khalil Ma’touq is a Syrian human rights lawyer who has been detained without charge or trial in Syria since October 2012. A large number of prominent human rights organisations continue to call for his release. The consensus of opinion amongst them is that he has been detained by the Syrian state because of his work as a human rights lawyer specialising in the defence of political prisoners. Khalil has been a human rights lawyer in Syria for many years. He has provided legal assistance to many political opponents, journalists, peaceful protestors and prisoners of conscience. This includes those tried by the notorious Supreme State Security Court. After the eruption of unrest in Syria, in 2011 Khalil played a leading part in the defence of civilians and activists. In 2012, he was a member of the defence team of Mazen Darwish and of his colleagues from the Syrian Centre for Media and Freedom of Expression. 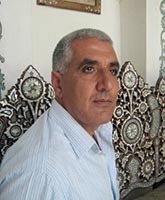 Khalil has regularly published articles and studies on human rights issues including a critical analysis of Syrian penal codes and their non-compliance with the Rome Statute and other international legal instruments. Despite the brutal nature of the Syrian regime and the difficulties Khalil has experienced as a human rights lawyer, Khalil continued with his work until his detention. Prior to his imprisonment he was subject to a travel ban between 2005 and 2011 and exposed to frequent harassment by the state security apparatus. Khalil’s courage and dedication to his work in the face of severe adversity are an inspiration to all those working in the field of human rights. Working towards achieving his release from detention continues to be an urgent task. Nominated by Rabii Fatihi, CPE Part Time Year 2 and chosen for the Inspired by Law gallery of lawyers and legal campaigners in 2015. Photo kindly provided by Amnesty International UK.